Kyle studied at the American Academy of Art where he received a Bachelors' of Fine Art with a specialization in oil painting in 2012. Since then he has been working full time as an oil painter to make this a lifelong successful career. 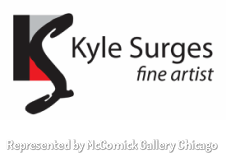 In 2013 Kyle achieved gallery representation through McCormick Gallery in the West Loop of Chicago. He met the owner, Tom McCormick in a local juried art exhibition where Tom participated as a juror. In this group show, Kyle displayed a painting of a small, unwrapped miniature Hershey chocolate - Tom was immediately drawn to the piece. He awarded Kyle 2nd place in the exhibition and purchased the painting for his private collection. Later that year Kyle had his first professional solo show in October at McCormick Gallery. His next show with Tom will be in the Spring of 2017. Aside from Kyle's solo show, he has also exhibited his work in numerous juried exhibitions; some he has been fortunate enough to win awards in. Kyle's greatest achievement so far is becoming a Luminart's Fellow in May 2015. He was a finalist in the Luminart's Visual Arts Competition for two consecutive years before winning the $5000 grant and Fellowship. Kyle says "It's an award I'm truly humble to receive". Craftsmanship is one of, if not the most important, attribute in the process of creating art. Paintings by the masters hanging on museum walls are not only conceptually stimulating and brilliant, but attain the highest possible level of craftsmanship. Kyle seeks to accomplish this degree of professionalism in his own art and career. Pride is taken in every step of the art creating process. Even his oak frames, which he builds himself, receive the same amount of attention as his paintings. Kyle strives to make art that he is proud of.